25 years of SPR: what have we learned? Although the phenomenon of surface plasmon resonance (SPR) was known for a long time (see Wood; 1902 (10), (11), (12)), in 1990 Pharmacia Biosensor AB brought the first commercial SPR instrument to the market (3), (4), (5). For a long time, these so-called Biacore instruments set the standard in research using SPR. Nowadays we say that we do a Biacore experiment when we mean that we do a SPR experiment. Since then, the instruments have been evolved and several new manufacturers are selling SPR instruments with new features (SPR imaging: IBIS; Interaction Array: Bio-Rad; multi-parametric SPR: BioNavis), new sensor chip types (alginate surface: Bio-Rad; hydrophilic SAM: Xantec; graphene surface: Sensia) and software wizards to guide the user. The instruments are all in best shape and performing excellent. However, how is the user doing? Has he also developed with the instruments or is he struggling to keep up? Judging to the literature (2), (8), (9), the knowledge of the user is still lacking behind of what may be expected. Therefore, I will discuss some basic steps that the starting user should know. A good understanding of the binding curves is the first step in understanding the data. 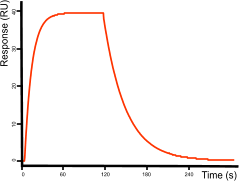 A well-behaved binding curve is an exponential that reaches a plateau when the association and dissociation rates are the same. As soon as one of the interactants is washed away, the complex dissociates in an exponential way. Inevitable, you will encounter curves not fitting the single exponential. You should know how to avoid these situations. The manufacturer did deliver an instrument in excellent shape. It is up to the user to keep it that way. This means regular maintenance, fresh (filtered and degassed) buffers and adequate equilibration of instrument and sensor surface. The reagents used in the experiments determine the result significantly. So make sure your reagents are well defined and of best grade. Check that your compounds are free of particles and biological active. Match the flow buffer to that of the compounds to minimize bulk shifts and drift. De design of the experiment is equal important compared to the reagents. The immobilization of one of the ligand determines the maximal response, possible mass transfer and stoichiometry of the system. The analyte concentration determines the actual response. Injection time should be long enough to have curvature during the association and dissociation time should be long enough to have sufficient analyte dissociation to determine the dissociation rate constant. Blank injections and replicates should be included in the experimental design to compensate for system drift, enabling double referencing and to prove that the system is stable (6). When reporting the results, always show the curves and the overlay of the fitting (7). Just reporting values is insufficient and leaves the reader in doubt whether the fit is following the curves properly. The global fitting procedure gives only one value (and standard error) per parameter per data set. Separate sensorgrams in a concentration series should not be treated as replicates for statistical purposes: they are part of a single data set (1). By running replicate experiments, more values per parameter are obtained and appropriate statistics can be determined. Just running an SPR experiment without sufficient knowledge of the technique and experimental conditions will give ambiguous results. High quality results come only with a good maintained instrument, high quality reagents and a proper experimental design. In addition, do not rely on SPR alone. Always confirm interactions with different techniques and/or functional assays. If you during reading of this article found some terms you did not understand, than it is a good idea to explore the SPRpages once more to make yourself familiar with the ins and outs of SPR and biomolecular interaction analysis. For more in-depth information, buy the SPRpagesBook. (1) Biacore ABInformation about BiaEvaluation 3.0. (2000). (2) Katsamba, P. S., I. Navratilova, M. Calderon-Cacia, et al.Kinetic analysis of a high-affinity antibody/antigen interaction performed by multiple Biacore users. Analytical Biochemistry352: 208-221; (2006). (3) Liedberg, B., C. Nylander and I. LundstromBiosensing with surface plasmon resonance - how it all started. (1995). (4) Lofas, S.Dextran modified self-assembled monolayer surfaces for use in biointeraction analysis with surface plasmon resonance. Pure & Appl.Chem.67: 829-834; (1995). (5) Lofas, S. and B. JohnssonA novel hydrogel matrix on gold surfaces in surface plasmon resonance sonsors for fast en efficient covalent immobilization of ligands. J.chem.soc., chem commun.1526-1528; (1990). (10) Wood, R. W.On a remarkable case of uneven distribution of light in a diffraction grating spectrum. (1902). (11) Wood, R. W.Diffraction gratings with controlled groove form and abnormal distribution of intensity. (1912). (12) Wood, R. W.Anomalus diffracting gratings. (1935).